Old structures and systems are breaking down while a new way of being, new structures and new systems are being birthed in the fertile soil now revealed. We are the vision carriers for generations to come. 16 Thought Leaders, Visionaries, Transformational Agents, and Spiritual Midwives will light your fire for 7 days straight! They will give you tools to help you see clearly the vision for your life - information to expand your consciousness to the next level and blow your mind! 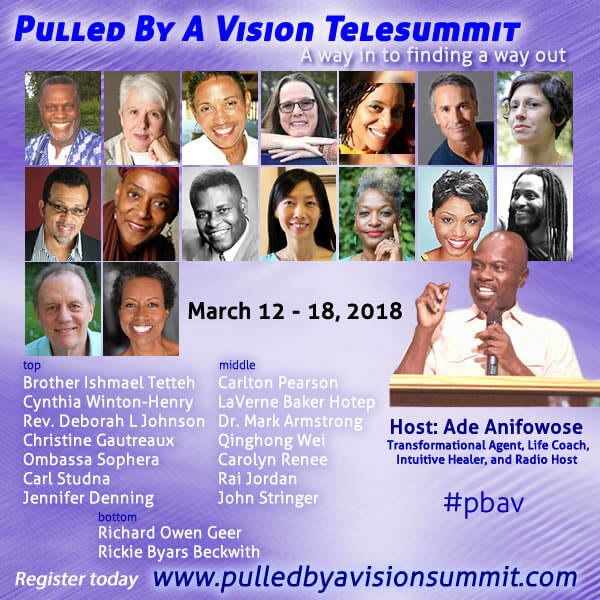 If you have had enough of being pushed by pain and you’re ready to be pulled by a vision, this telesummit is for you! Sacred Activism - Spirituality with teeth and deep compassion for social change. Visioning - Deliberately creating the future in every moment. The Wisdom of Nature - Ancient insights that have sustained lives before time was time. Numerology - The Universe has your number, will you answer the call? Creativity - Activate your power to re-write your past, present and future. Awakened Relationship - A spiritual practice for self-fulfillment, transformation and harmony. Energy Medicine - Align with the natural vibrations of all life and be healed. Art and Social Justice - Raising awareness and breaking down walls that divide. African Spirituality - Indigenous wisdom that honors both the feminine and masculine energy of the Creator and the Oneness of all things. This is YOUR invitation to live the future now! From this place and space in consciousness, YOU are giving yourself permission to create the future you desire to see. This is the Best of YOUR Times! Say, “YES!” to the New Vision for Your Life!